This blog post was written by Harrison Wood, a new rider funded by the Dave Rayner Fund for 2019. You can read the original post here. For those who follow me on Twitter you would’ve seen that recently I have had some good race results over here in France. Firstly I had the Ronde de Montaroux, a category 1/2 race. Last years edition was won by a member of the team who is now professional and I thought with the team we had it would be possible to win it again. However, the circuit was changed due to safety reasons, it became an 80km crit. 59 laps with 2 hairpin bends and a couple of 90 degree bends. This is something that I thought wouldn’t suit me at all. The race itself split very early, around lap 3 I bridged across to a break of 8 which included 4 AVC AIX riders. A brilliant scenario which resulted in several shouts of “A BLOC” which means full gas. A few laps later the group cohesion was low so 2 riders from our team attacked, this resulted however in 2 guys being dropped from other teams. Now we were in the driving seat. For the next hour odd me and Axel (team mate) sat on as the other 2 continued to work. With 5 laps to go we attacked them and were together in front. We rolled across the line with me taking 3rd and him taking 4th. Whilst Jonathon and Guillame took 1st and 2nd. A great result and my first podium of 2019. Next up for me was the Multipole Berre stage race. A big stage race in the area of Provence, my new home. This race has been dominated by Chambery Cycling formation (AG2R pro feeder team) however this year would be the first time in 4 years that they didn’t win or dominate the racing. The first stage was pretty flat and windy, but the wind direction meant the only section of crosswind was on the climb. It was a super attacking race with no teams wanting to miss the break. I was involved in the battles but never put all my cards on the table. With 30kms to go I noticed a good break up the road, the bunch slowed so I jumped. I went across with 5 others to form a group of 10 up front including another lad from my team. We worked well together and had a gap of 30seconds on the chasing peloton. With 2kms to go we turned off the circuit into a tailwind, the break eased so I hit it hard in the gutter. I then went for it. A quick glance and I had a gap. The legs were burning but this kind of effort is something id worked with Kristian on. I never looked back until 5 yards before the line where I saw I was going to win. Arms in the air and I had done it. First win of 2019 for me!! I then had to do an interview with local press in French and also on the podium. That was the hardest part of the race for me no doubt! I was in yellow and the 2nd day bought about a TTT or as the French call it a chrono par equipe. We were off last due to me leading the GC as well as the young riders. This wasn’t a technical course and we flew round the 14km course with an average speed of 53km/h. We won, by 20 seconds over Chambery in 2nd. I had extended the GC lead and been involved in my 2nd win of 2019. Now was the final stage. 110kms of attacks and attempting to defend with 5 riders. Early attacks and all still under control. We continued to ride a good tempo but the team began to struggle after helping early on. Then with 50kms to go the team were done in, then the worse possible thing happened. I came round a tight right hander on the front to see the lead car stopped mid corner, no saving it I ended up in the ditch. At this point a few teams took there opportunities to attack. One team mate waited and paced me back on, but now he was done in. I had to ride solo now. I settled into a rhythm but the gap to the break of now 12 riders was getting bigger. The GC was slipping away. With 20kms a couple of teams came to help but it was too late. We lost the GC by 40 seconds. I was left deflated knowing that if I hadn’t of crashed it could of been a different outcome. But I was happy to of got 2 stage wins and finish 7th on the GC. On the whole a good weekend. 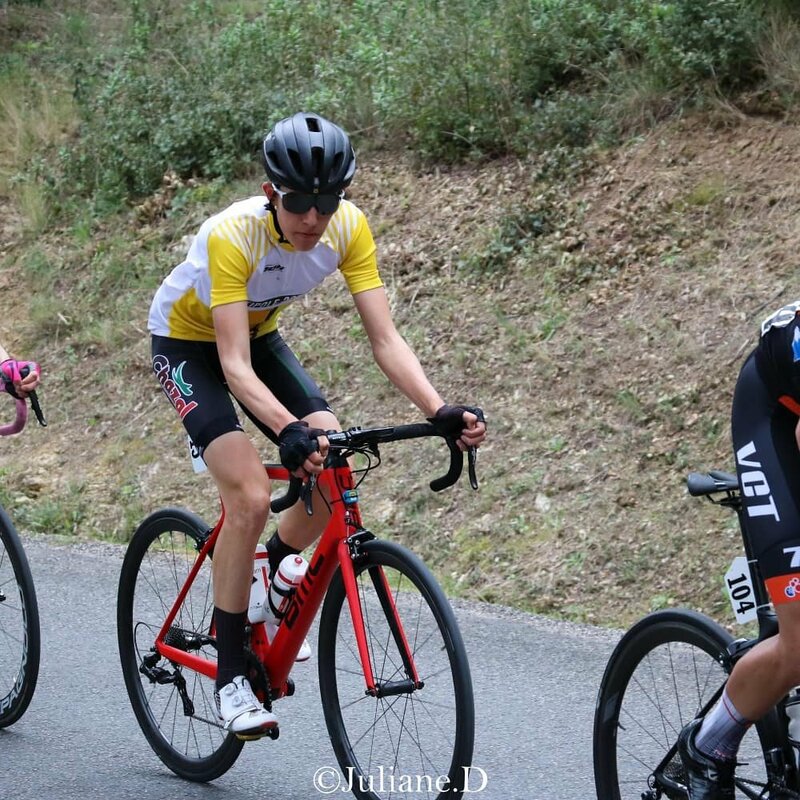 This coming Sunday I have the GP de Sisteron, a fairly local 95km race with 13 laps. Flat but off recent results I would like to try and get another podium or even the win. Thanks to the Dave Rayner Fund for allowing me to pursue my dream abroad. Thanks to the guys at Bay Cycles and Molyneux associates for there support in 2019! !